This new service from Facebook may help customers find you. Facebook has recently rolled out a new feature called “Services”. This is a directory of local businesses who provide a particular service. Some are calling this a stealth project to beat out Yelp as it lets consumers find the most highly-rated businesses in their area. Users of this service see a page with their location pre-selected. And the service makes heavy use of Facebook’s five-star rating. Log on to your business page. Click on Services under the page header. This is a button only those with the ability to edit the page will see until you publish services. 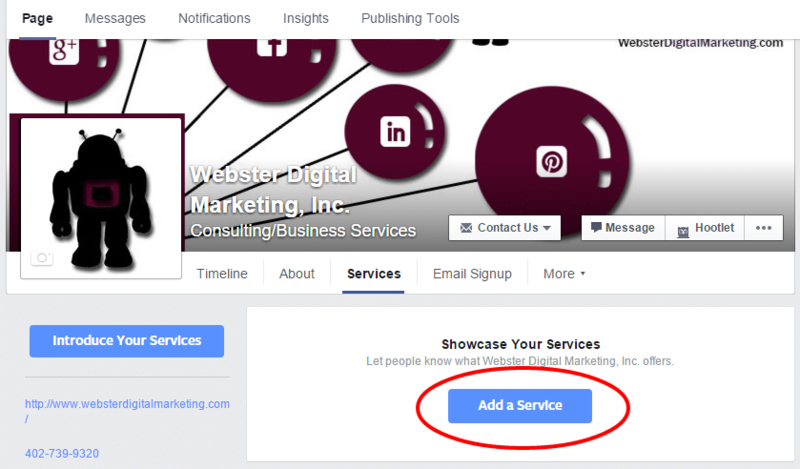 Add a service to your page. Be sure to pick a title that uses the keywords you believe people will use when searching for your business. Space is at a premium. You only get 40 characters for the title and 200 for the description so make them count. The services will appear in the reverse of the order you add them and there is no way to reorder them so, contrary to what may be your instinct, enter your most important services LAST so it will appear first in the list. 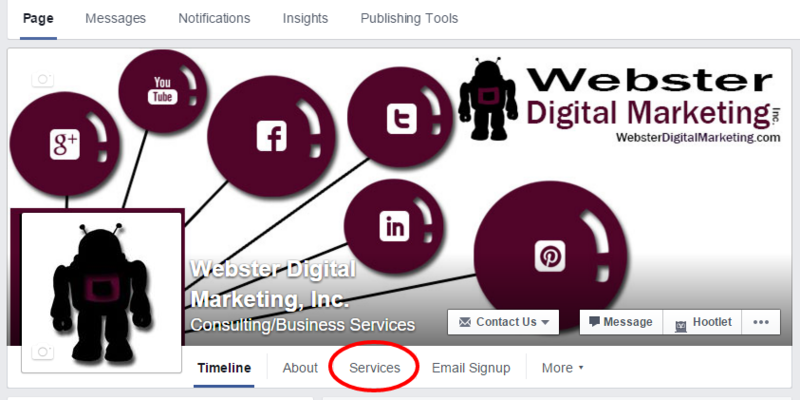 The first 3 services will appear on the Timeline of your business page, but you can add more. And there is a link to view the rest of the services you list. You can add multiple images to the service but only one will appear in the listing. The image needs to be square. If you add an image which isn’t square, Facebook will just crop all the edges, centering on the middle of the image. So, I recommend you edit the image and get it square before you upload it. Add an introduction to your services. Again, space is at a premium with only 40 characters to work with. Publish your services. They will not show up to others who are not administrators if you don’t publish them. Facebook will ask you to confirm that you want to publish them. 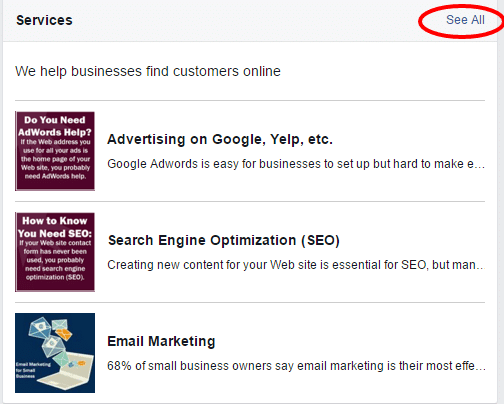 Since Facebook services are completely free, it can’t help but increase exposure for a business to set this up. I recommend it to all my customers. 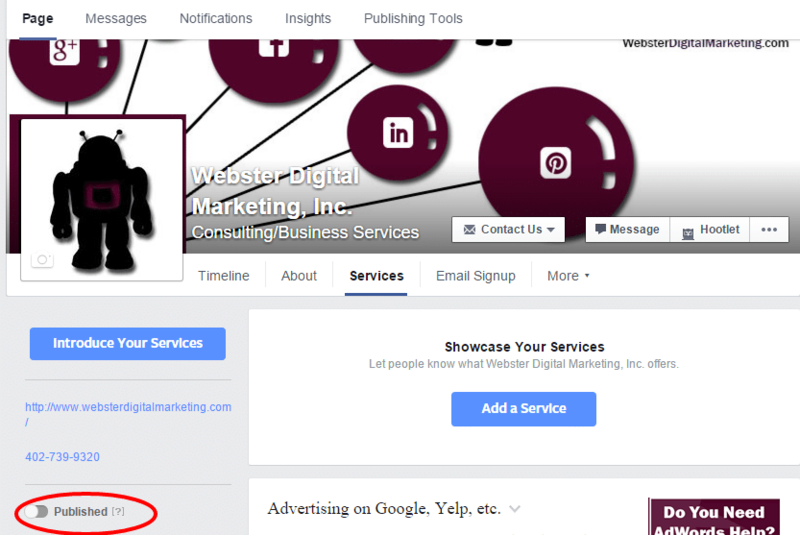 If you need help setting up this Facebook service or anything else in your social media profile, please contact us today.